95% of the reported Bitcoin (BTC) trading volumes are actually forged and fake. What was once taken to be as an allegation, is now having a documented proof, a research conducted by Bitwise Asset Management. In February this year, CoinMarketCap (CMC) was accused by the crypto community of promoting fake cryptocurrency exchanges by failing to delete them from its platform. Of recent, TIE issued an independent analysis report of disagreements surfacing in the volumes of crypto exchanges. From the TIE’s research, it was discovered that around 75% of them actually do fake volume data. However, TIE and Bitwise used totally different approaches but at the end they came out with a similar conclusion. The parameter of the research was the trading volume data relating to the amount of BTCs held in the crypto exchanges. The company compared the data from numerous exchange platforms, the research discovered authentic similarities in just 10 of them. The research also revealed that only 9 out of 10 exchanges have acquired the necessary regulatory licenses. The nine exchanges which are said to have been reporting correct trading volumes include Poloniex, BitFinex, Kraken, BitFlyer, itBit, BitStamp, Gemini, Bittrex and Coinbase Pro. Binance was excluded of this Top-10. According to the report, the total daily BTC spot volume is around $270 million, making it 95% less than the figure provided by CMC. Just 10 virtual currency exchanges have got BTC trading volumes larger than $1 million daily. Some of these companies include Circle Pay, Gemini and all the aforementioned exchanges. 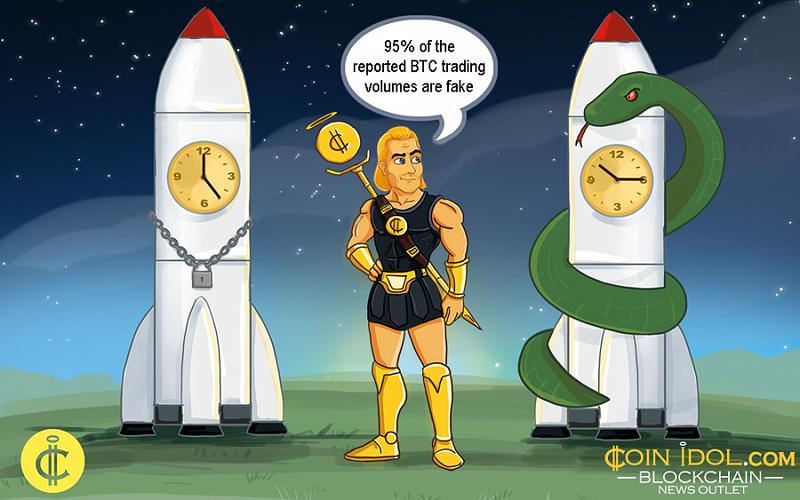 The total trading volume is a sole factor which does not play any part in both the “circulating supply and the price.” Therefore, the entire market cap (MC) will not be directly influenced by the trading volume being report, but the inflated day-to-day reports of trading volumes could in one way or another negatively influence the market feelings. 20/ We hugely appreciate the SEC being careful with their review of bitcoin ETFs & digging into the detail. Leveraged ETFs took 6 years for approval. Actively managed ETFs nearly 6 years as well. The 5+ year bitcoin journey is not atypical. It's necessary for investor protection. The job well done by crypto research company, has given the U.S Securities and Exchange Commission and the Commodity Futures Trading Commission (CFTC) a major task to start working on the decision about the exchange-traded funds (ETFs) and make other major regulations such as commanding all the exchanges to exclude the exchange data and again take prices strictly from the regulated exchanges. Next PostBig Bitcoin (BTC) Drop Coming?